What kind of Bull Terrier-lover is it that favours a rugger-ball for its head? Why do show Bull Terrier fanciers tolerate such an insult to their fine breed? Why does the Kennel Club bestow an egg-shaped head on just one breed - in defiance of that breed's own history? The description of the Bull Terrier in 1896 produced by its breed club, established nine years earlier, used these words to describe the head: "...should be long, flat, and wide between the ears, tapering to the nose, without cheek-muscles. There should be a slight indentation down the face, without a 'stop' between the eyes." Winning dogs at the early shows featured heads roughly answering this description. A definite type emerged, based on a determined eye, a strong jaw and overall symmetry. Sketched by Arthur Wardle in the 1890s, the breed had a confident, athletic, self-assertive look about it, with the head of what might be termed a strong terrier. 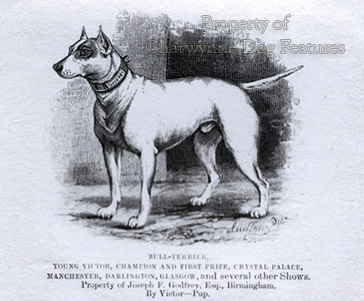 In his "The Illustrated Book of the Dog" of 1880, Vero Shaw described the head of the Bull Terrier as: "...flat, wide between the ears, and wedge-shaped; that is, tapering from the sides of the head to the nose; no stop or indentation between the eyes is permissible, and the cheekbones should not be visible." Prophetically, Vero Shaw complained about judges, stating that "...we see, show after show, dogs gaining prizes in these classes which do not show one atom of Terrier character in their composition"...going on to describe them as "cow-faced wretches". 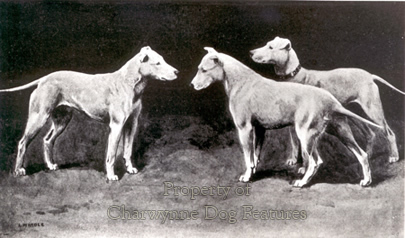 The early years of the new century saw three major changes to this breed, each was to have a significant effect on the breed. First of all came a striving to develop a better-shaped uncropped ear, which has given us the prick ear of today. Secondly, in a effort to re-instil some of the gameness once famous in the breed, a back-cross to the coloureds (called Staffordshires) was undertaken, leading to the wider range of colours in the breed today. And, thirdly, in 1914, the first unwisely-worded ‘Standard of Perfection’ was introduced. 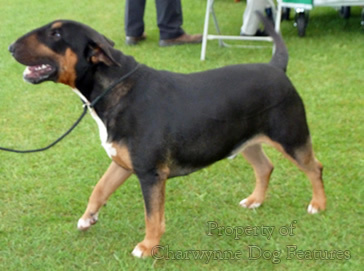 This was the first time the words ‘gladiator of the canine race’ were used for the breed, now dropped in the recent KC review of potentially damaging descriptions. But sadly, the wording of the breed standard regarding the head changed quite dramatically. The Bull Terrier's head was henceforth expected to appear "oval, almost egg shape" with a profile "…almost an arc from the occiput to the tip of the nose. The more down- faced the better". For the first time in the long history of the dog, a breed was required to have an egg-shaped head. The reason for such a unique and unprecedented feature has never been stated. The Bull Terrier already had a clear identity and an established type when this rewording was agreed, so it could not have been to create a prototype. 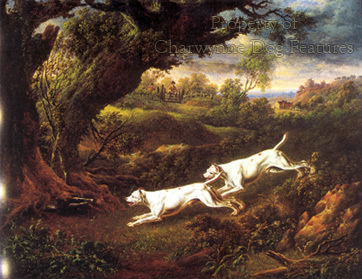 Writing on the Bull Terrier before the Second World War, Hogarth described the foreface with this analogy: "...the curve of the profile should be 'Roman', as in, say, the Border, Leicester and Cheviot breeds of sheep." So we now had a redoubtable British breed of dog, renowned all over the world for its guts and gameness, needing to have its head resembling that of a sheep. Why a breed created from a blend of Bulldog and terrier should suddenly need a foreface like a sheep has never been explained. 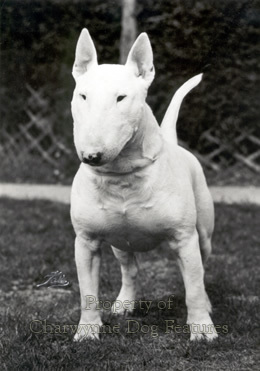 But if you took a pedigree Bull Terrier into a contemporary show ring without an egg-shaped head, you'd be laughed out of the ring. 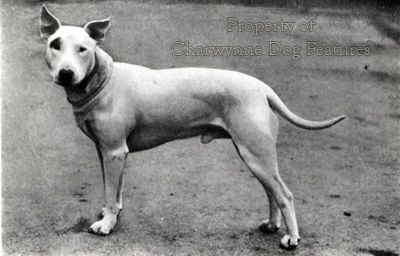 Yet in 1926, a noted breeder, Mrs DH Robbs, edited a book entitled The Bull Terrier Handbook, which pictured over 50 Bull Terriers of that time, including such notable dogs as Ch Galalaw Benefactor, Ch Hades Cavalier and HK Mc Causland’s Wildfire, as well as some from Mrs Robb’s well-known Cylva kennel, and not one of them featured the egg-shaped head demanded by the breed standard of that time. 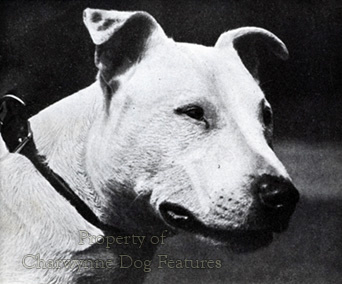 The breed standard of the Bull Terrier, as authorised by the Kennel Club today, now includes under "characteristics" these words: "…A unique feature is a downfaced, egg shaped head." This so-called unique feature has only been a feature for seventy years or so; for fifty years before that it was not a feature at all. 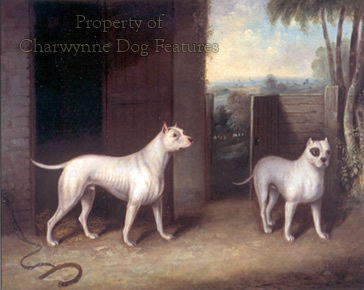 Such an absurd shape did not characterise the prototypal dogs; James Hinks, his sons and other early breeders: SE Shirley, EH Adcock, RJ Hartley and JH Ryder would be greatly ashamed to see their dogs betrayed in this way. Tom Horner, who knew as much about Bull Terriers as anyone in the 20th century, has written on this subject: "The filled-up downfaced head is individual to Bull Terriers...No one knows exactly how it came into the breed, Hink's original white did not have it..." In other words, it never was an original feature of the breed. It is an old tactic to invent new words in order to blur issues or try to justify the unjustifiable. The word "downface" has no meaning; it was coined to legitimise an uncharacteristic undesirable feature which developed in this breed. Horner also wrote: "On balance it seems likely that the filled-up downface is the product of skilled breeding..." I am not sure that it wasn't the product of unskilled breeding by those without the touch of James Hinks and afraid to outcross to remove a strong alien feature cropping up in their stock. Far easier (and defeatist!) to authorise it! Then along comes the Kennel Club and legalises it! The simple fact is that this "downface" should never have been allowed to develop in this quite admirable breed; it disfigures a famous dog, it attracts ridicule from the general public, it detracts from the symmetry and athleticism desired in such a breed and its mere existence exposes a breach of the original standard laid down by those who first developed this distinguished breed. The fact is that it is an exaggeration, that all exaggerations end up exaggerating themselves and that, in time, the head of the breed will look quite monstrous. It is likely to ‘morph’ into a globe, with no protection for the dog’s eyes and not enough room for normal teeth. 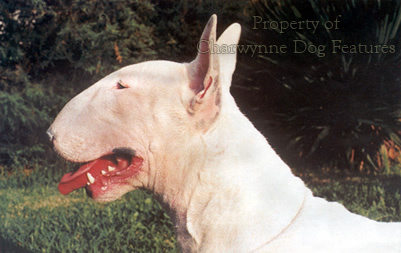 Do we truly want a globe-headed Bull Terrier with its eyes popping out and poor dentition? The dog-owning public is coming to its own conclusion. 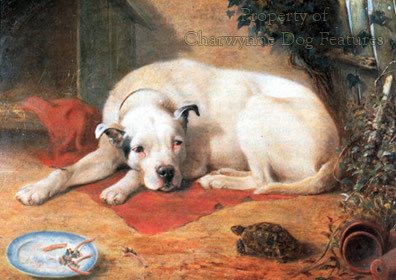 In 1972, there were twice as many Staffordshire Bull Terriers registered as there were Bull Terriers; in 1988 there were three times as many; in 1998 there were four times as many. Twenty or so years ago, I wrote to one of the dog papers expressing my concern not just over the egg-shaped head, but also over the piggy-eyes and stiff movement prevalent in the breed. In response I got a very patronising letter back from the most influential Bull Terrier breeder of the day, that in essence said "Mind your own business, leave such judgements to us." The well-being and conservation of our precious native breeds of dog, part of our national heritage, is far too important a matter to be left in the hands of breed-point faddists. 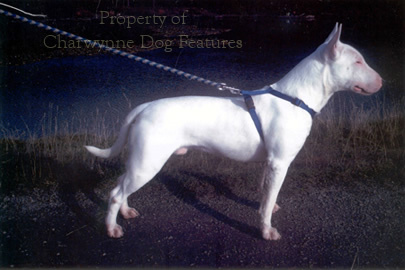 I go to 'alternative' dog shows, unlicensed by the KC, and see what are termed 'Irish Staffies' and they look exactly like the old prints of our renowned Bull Terrier. Lyndon Ingles of Tredegar has kept the faith and perseveres with the classic type of white Bull Terrier; his dog, aptly named ‘Hinks’ is as good a specimen of the breed as you are likely to find. This breed used to be owned by gruff characters, who didn't set much store on conforming - just as bull-and-terrier owners didn't in the 19th century! Our Bull Terrier is a very special British breed and it is being ruined by a bunch of misguided show breeders, who have no regard for the breed's classic physique and truly typical head. How can any rational person, especially an alleged lover of that breed, justify the imposition of a sheep's head on a dog's body? It isn't traditional; it isn't an improvement, if anything it is a deformation, a disfigurement. It is an outrageous liberty taken by faddists and condoned by the KC. Any admirer of our native breeds of dog, especially one as characterful as this one, should frown when they see this travesty, this parody being paraded 'sheepishly' as the real thing. Come on, terrier-men of Britain, let’s put this right!